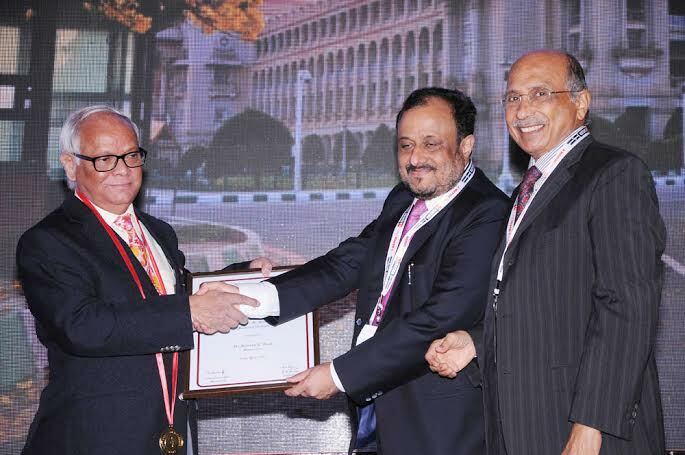 Dr. S. C. Dash, Director, KIMS & Pradyumna Bal Memorial Hospital has been awarded with prestigious ‘JCM Shastry Memorial Oration’ to be delivered during 46th Annual Conference of Indian Society of Nephrology (ISN). The Conference held recently in Bangalore, where he spoke on “Fight against Chronic Kidney Diseases in Indian Context”. Dr. Dash is currently one of the senior most nephrologists of India. He has many laurels to his credit. He has been the Professor & HOD of Nephrology, Dialysis and Transplant Medicine at AIIMS, New Delhi for 31 years. He has more than 250 scientific publications 100 of which are international journals. He was the past president of ISN & Founder President of Nephrology-Urology & Transplant Society of SAARC Nations (NUTS of SAARC) in 1995. He is the Founder of Northern Chapter of ISN & Current Founder President of Indian Academy of Nephrology. Recipient of several prestigious Orations including RN Tagore Oration from Association of Physicians of India. He has been invited by several universities in UK, USA, Japan to deliver guest lectures. Recently in another achievement he was elected as the “International Educational Ambassador in the field of Nephrology” by the International Educational Program Committee (EAP) at Johannesburg , South Africa.